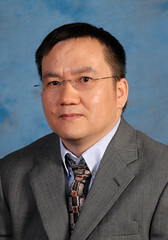 Dr. Li Shi is the BF Goodrich Endowed Professor in Materials Engineering at the University of Texas at Austin (UT). Before joining the UT faculty in 2002, Dr. Shi investigated thermoelectric materials and devices for a year as an IBM Research Staff Member. His inventions of micro-devices for studying thermal physics in individual carbon nanotubes earned him a doctoral degree in Mechanical Engineering from the University of California at Berkeley in 2001. He received a master degree in Mechanical Engineering from Arizona State University in 1997 and a bachelor degree in Thermal Engineering from Tsinghua University in 1991, both for thesis research in combustion, before and after a four-year industrial research experience in an electrical power research institute, respectively.. The goal of Prof. Li Shi’s current research is to accelerate the discovery and understanding of quantum materials for device and system technologies that can contribute to a sustainable global society. One focus of his research is on materials, devices, and systems for enhancing the performance and energy efficiency of electronics, transportation, and buildings and for enabling cost-effective solar energy utilization technologies. His research group has demonstrated a set of unique methods based on nanofabricated measurement devices, scanning probe microscopy, and optical spectroscopy to characterize quantized energy carrier transport and conversion in nanostructures and complex superstructures. The publications from these groundbreaking works have been highly cited, and have led to a better understanding of the extraordinary quantum transport phenomena in these materials. Based on the findings from some of the fundamental research efforts, his group further investigates energy-efficient solid-state electronic and energy devices, thermoelectric vehicle waste heat recovery, thermal energy storage, and solar energy utilization. His other research efforts include thermal management of nanoelectronic devices, and nanotechnologies for drug delivery and biomedical imaging. Among Dr. Shi’s synergetic activities, he has co-organized a NSF sponsored workshop on Nanotechnologies for Solar and Thermal Energy Conversion and Storage, the Seventh US-Japan Joint Seminar on Nanoscale Transport Phenomena, and the Third ASME Energy Nanotechnology International Conference. He has also chaired a number of symposiums and sessions for Materials Research Society (MRS), American Physical Society (APS), and American Society of Mechanical Engineers (ASME) conferences. He has served as the Editor-in-Chief of Nanoscale and Microscale Thermophysical Engineering since 2013. Dr. Shi’s research achievements and professional services have been recognized by the Heat Transfer Memorial Award in Science from ASME, the Invitation Fellowship for Research in Japan from Japan Society for the Promotion of Science (JSPS), the O’Donnell Award in Engineering from the Academy of Medicine, Engineering, and Science of Texas, the ASME Transaction Journal of Heat Transfer Outstanding Reviewer Award, the Young Investigator Award from the Office of Naval Research, and the Faculty Early Career Development (CAREER) Award from the National Science Foundation. He is an elected fellow of ASME and APS as well as an active member of the UT Austin Badminton Club.